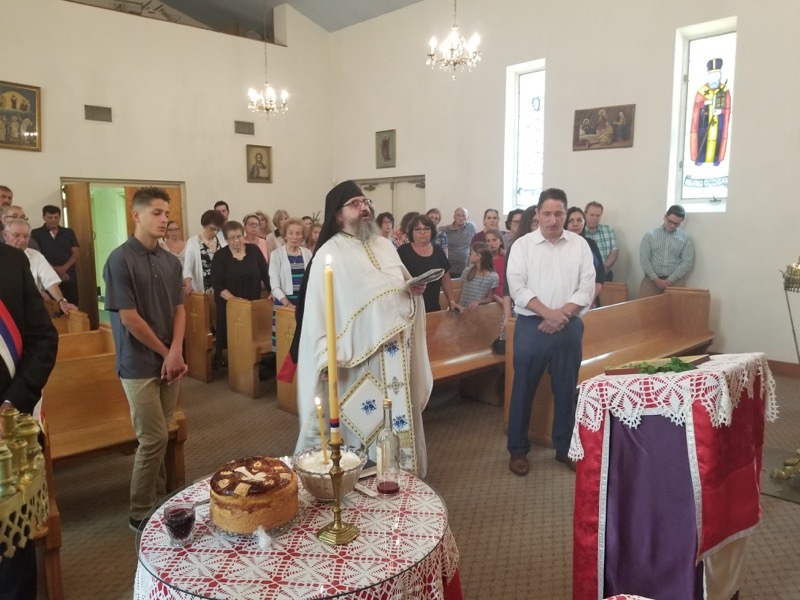 With the grace of our merciful God and with the Archpastoral blessing of His Grace Bishop Irinej, on Sunday, August 5th,our Church celebrated St. Elijah, our patron saint. We were blessed to have with us Very Rev. Protosingelos Sava (Medakovich) from Monastery Marcha and Rev. Presbyter Vedran Grabic, our parish priest. This was the first time in the history of this parish that all of our neighbors joined us in the celebration of our patron saint. Members of Saint George in Hermitage and both Holy Trinity parishes of Youngstown decided to close their Churches. With love for each other, and with the directive and Parental love of His Grace Bishop Irinej, they partook in this divine celebration together. God blessed us with a beautiful morning- rays of sunlight with a slight breeze- giving us a feeling of happiness and unity with God. The faithful people were visibly lighthearted, and our hosts very happy to see the Church full of people and children becoming one with God while partaking in the Divine Mysteries. In very inspiring sermons, Fr Sava and Fr Vedran extended the greetings and blessings of His Grace. They stressed the importance of unity and oneness with God and each other. After Divine Liturgy and the blessing of Kolac and Koljivo, our Circle of Serbian Sisters prepared an abundant festal lunch, enriched with various treats from sisters of neighboring parishes. This was a wonderful opportunity for people to get to know each other better, to share their concerns and experiences, and to ask questions about the future of our churches in this area. All of us agreed that we should assemble around our Bishop, priests, and together preserve unity with God and our Holy Church. This year's Kumovi were the Brakus Family, faithful members of our parish, who are generous donors and benefactors not only to our church but to all those in need. May the Lord God through the prayers of St. Elijah preserve His Church, unite and multiply His flock for many more years to come.